Far from the end of Lonely Street, it’s apparent from first impressions that Graceland was a beloved retreat for Elvis. Though modest in size and outward appearance, the colonial style home bears Elvis’ unique sense of style – or it could have just been the Seventies, man. 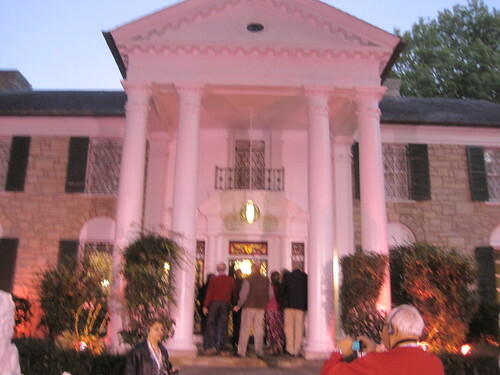 I’m not one for hero worship, but I jumped at the chance to attend the theme party at Graceland. The chance to see a snapshot in time, 1978ish (confirm), was well worth the trip. Upon entering the home, visitors are first introduced the fairly traditional family room and dining room. The front room actually has a beautiful stain glass detail that tastefully fits with modest décor. Elvis’ bedroom was fairly tame, and a bathroom’s just a bathroom. The kitchen was interesting for the contrast of 1970s appliances with modern equipment. I guess even the extremely wealthy were limited to pea-green colored refrigerator doors. Things got more interesting as you proceeded into the rear of the house. The jungle room was adequately named. It was furnished with a number of exotic wood carvings and a waterfall. I was most surprised by the use of green shag carpeting on the ceiling. We gained more insight into the creative mind of Elvis by descending the mirrored stairway to the basement. His man cave was “professionally” designed by a top architect of the day to feature his favorite colors, yellow and blue – actually, pretty appealing to a Michigan grad like myself. For the time, it was very unique to have multiple televisions that could be tuned to different stations. 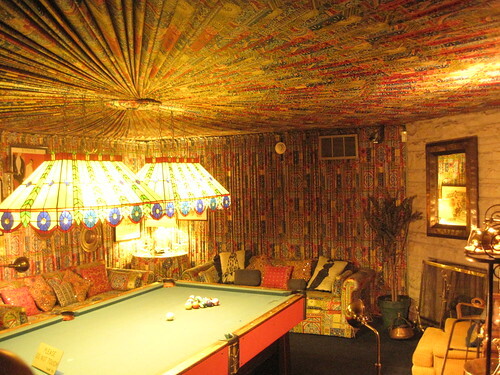 The basement also featured a pool table room. I think all visitors agreed that the floor to ceiling red and gold print drapery was just a tad too gaudy. Just standing in the room long enough could elicit a psychedelic experience. The pre-recorded tour audio again credits a famous designer for the motif. One must wonder whether that individual still stands by their work. The tour continues on outside past the carport, the guesthouse/office, smokehouse/shooting range, and racketball building. If that combination sounded a little strange, well, that just what the King wanted. Consider also that his favorite snack was peanut butter and banana sandwiches, which were also lovingly prepared for our after-tour dinner. 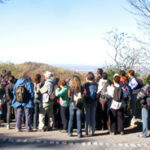 A museum chronically the life and accomplishments of Elvis was also included in the tour. Everyone was impressed by the sheer number of gold and platinum records. Elvis acquired so many awards that their display was split between the museum building and the old racketball court. 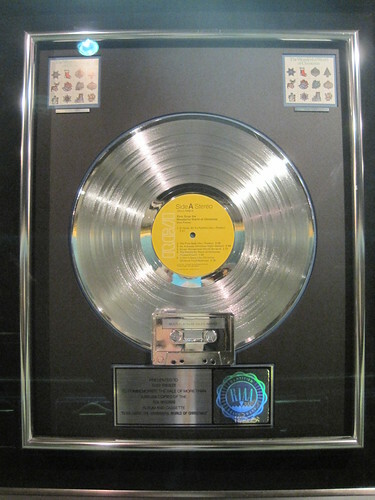 A few of the “platinum records” also depicted a cassette tape in precious metal. I can just imagine the thought process of the executive responsible for that decision: we want to look like we’re hip to the latest technology; cassettes are the future. The collection of Elvis’ stage costumes and memorabilia from his acting days were also quite amusing. 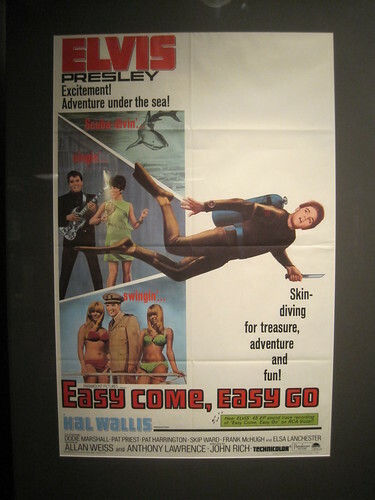 I loved this movie poster for Easy Come, Easy Go. See Elvis scuba divin’, singin’, and swingin’… with a knife. 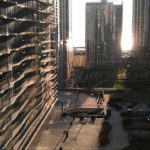 And what’s with the artist’s rendering? Did they find the one guy who didn’t know Elvis signature style? At another location visitors can also view many of Elvis’ cars. While his home was fairly modest, it’s clear that he was willing to spend top dollar on his toys. Several Rolles Royce were on display, along with other custom designed cars and a pink Cadillac. It was fairly apparent that fuel economy was not a consideration in Elvis’ day. 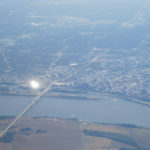 The biggest fuel guzzler was his personal jet airline. Now this luxury was really impressive. Although dated by the upholstery and the built-in eight-track player, the plane impressively included a world phone from which Elvis could reach any land line from 30,000 feet. The plane also included ample room for a full-size bed. He knew how to travel in style. The tour ended on a sober note. Elvis and his parents are buried side by side at Graceland. 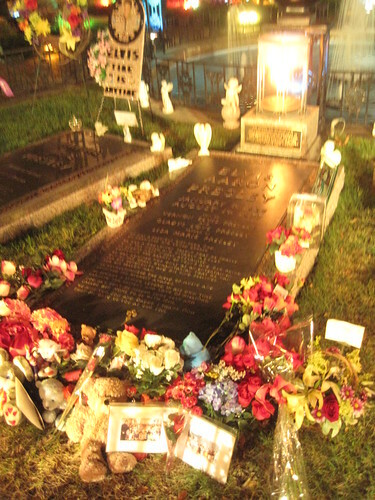 Fans continue to bring mementos and flowers to lay on his tomb. By all accounts, this seems a fitting eternal resting place for an international superstar who never lost a sense of his humble roots.